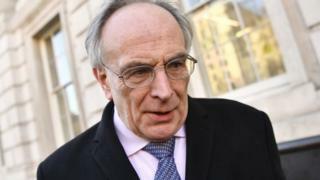 There is no evidence that attitudes among Eurosceptic MPs towards Theresa May's Brexit deal are softening, Conservative MP Peter Bone has said. The Eurosceptic MP, who has spoken in favour of leaving the EU without a deal, wants the Irish backstop clause to be ditched. But he would "wait and see" what the negotiations produced. Speculation about a split in the Brexiteer ranks was sparked by comments from Jacob Rees-Mogg. Mr Rees-Mogg, who is chairman of the European Research Group of Brexiteer Tories, said he disagreed with those who were demanding changes to the legal text of the EU withdrawal agreement. He said he would accept an appendix to the legal document. Other leading figures in the ERG, including deputy chairman Steve Baker, have previously dismissed the legal annex to Mrs May's agreement being negotiated by Attorney General Geoffrey Cox as insufficient. Mrs May is continuing negotiations with the EU to try to seek assurances to address MPs' concerns, after her Brexit deal was overwhelmingly rejected by MPs last month. She is still in talks with Brussels over the Irish backstop policy in her plan - which aims to prevent a hard border returning to the island of Ireland - and has assured MPs they will get to vote again on the deal by 12 March - just 17 days before the UK's scheduled leaving date. The PM's spokesman said on Thursday there had been progress in talks with the EU, but there was still a significant amount of work to do. Is Rees-Mogg ready to compromise? ERG member and former Northern Ireland Secretary Theresa Villiers told the BBC that she could not support the prime minister's deal with the backstop in its current form. "Essentially it locks us in as an EU satellite, obeying their customs and regulatory rules without having a say over them, so I don't think it's really leaving," she said. "That's why I have very significant problems with it." Image caption Tory MP and ERG member Theresa Villiers called for a "legally binding treaty change"
When asked whether there was a split of opinion within the ERG on a solution to the backstop issue, Ms Villiers said there was "undoubtedly a spectrum of views within the Conservatives on this". "We're all looking to try to find compromises. Whatever the prime minister comes back with from Brussels we'll look at it seriously." She said if the deal is changed enough to allay her concerns about being permanently locked into an arrangement with the EU, "then that is something possibly I could support". "But it would have to be legally binding treaty change." Peter Bone, who is not a member of the ERG, said: "We'll wait and see whether that negotiation is successful or not. If she can deliver that I think she'll get a deal." But he added: "If the backstop in any way is in place, in other words that could keep us permanently in the EU, then Mrs May's deal just will not go through Parliament."